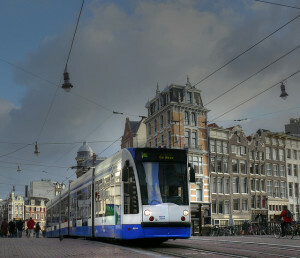 The “tram” is a very common means of transportation in some of the bigger cities in The Netherlands. It is a vehicle, conducted through rails, for short distance transport of passengers, with a maximum speed of approximately 50 km/h. You can turn “tram” into a verb by adding -en. The verb “trammen” translates to “to go by tram”, but is more common to say: “met de tram gaan/reizen” (“to go/travel by tram”). When riding your bicycle you have to be careful when you try to cross the tram tracks; you are in big trouble if your front wheel is caught in the rails! This expression can often be heard in project meetings where it is used to express fear of losing corporate knowledge. This entry was posted in Dutch word of the day, DWOTD 1.0, Vocabulary Basic and tagged openbaar vervoer, tram, voertuig by Dutch Gurus. Bookmark the permalink.